A free photo-centric social sharing app called Path was launched early this week by a familiar face in social media: former Facebook Platform Manager Dave Morin. Just don’t call it a social network, though. Path – unlike Facebook, Twitter, or LinkedIn – is being positioned as “the personal network”. Sounds like Facebook Photos or Flickr – but there is this twist: with Path, you can only have up to 50 members in your network. Fifty and no more. That’s right. At a time when Facebook users are sharing bits and pieces of their lives to up to 5,000 friends, and where people are tweeting all kinds of information for thousands and thousands of followers to see, Path is going the other way, forcing its users to share their personal photos with no more than 50 people: a less social activity, sure – at least in terms of sheer numbers – but a more personal and meaningful one. Or at least the company hopes so. So it looks like the idea behind Path is validated by serious mathematical stuff – thereby making “over-sharing” impossible. More than that, though, it has gained the support and backing of a long list of angel investors, tech entrepreneurs, Silicon Valley insiders, and even Ashton Kutcher. Morin’s co-founders? No less than Napster co-developer Shawn Fanning and Macster co-creator Dustin Mierau. The idea of a personal network instead of a social one is intriguing enough (“quality over quantity, right?”), but we’ll have to wait and see how the company plans to expand the features of Path. (Text updates, perhaps? Location-based sharing a la Foursquare?) Sure, masses love the idea of exclusivity (and being one of the few), but right now Path is no more than a photo-sharing app for a network of fifty. 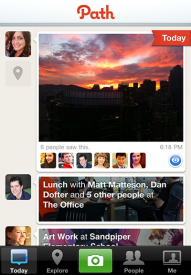 Path is available as a free app for the Apple iPhone. If you don’t have an iPhone, you can still register using your web browser.